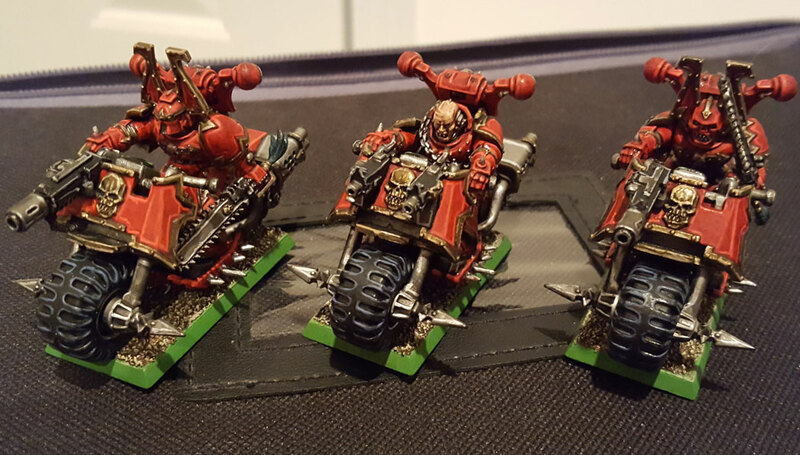 The Khorne Bikers are now really finished for my Daemonkin army. I worked on the handlebar buttons and the console display and got it done. Did the bases, too. I used ‘Ard Coat to varnish them and then Lahmian Medium to take the shine off the varnish. 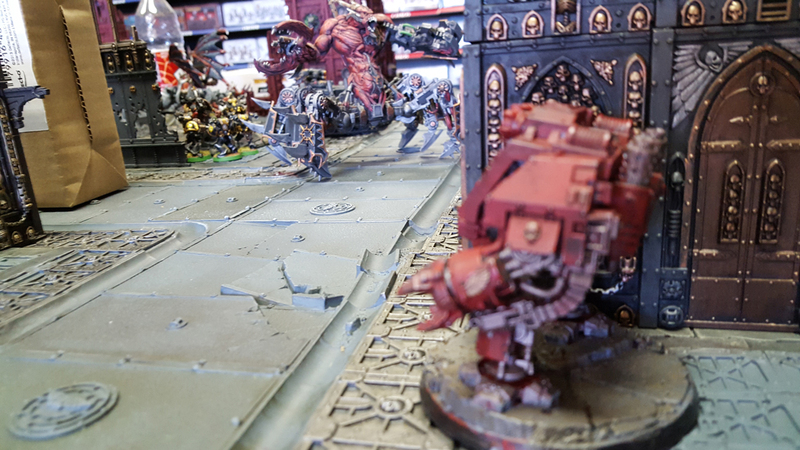 Well, I was able to get in a game yesterday at the local Games Workshop store. It was a pick-up game at 1,500 points, with my Khorne Daemonkin against Blood Angels. This was the first time I’d faced Blood Angels since they got the new codex. It was a fun game. 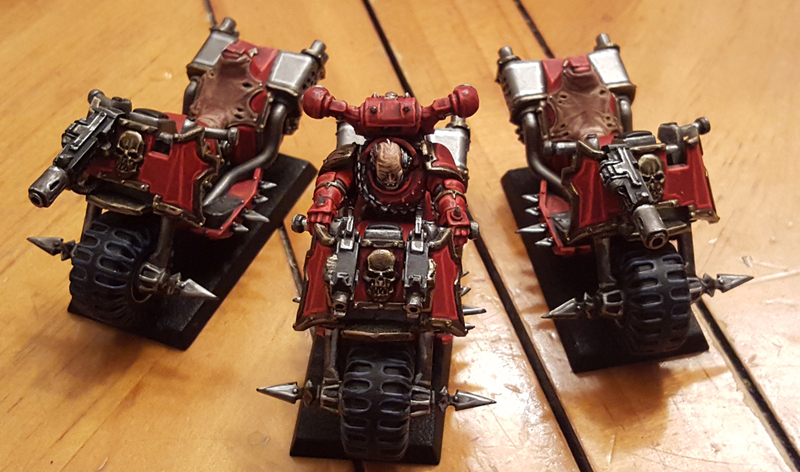 I was able to run a Bloodhost Detatchment, with a Gorepack, Soul Grinder (War Engine), and a Slaughtercult, with an attached basic Bloodthirster. The Slaughtercult was made up of a Lord on a Juggernaut, a squad of Berzerkers, a squad of Bloodletters, a squad of Chaos Space Marines with a Rhino, and a squad of Possessed. My opponent ran a couple of assault squads with jump packs, a Death Company squad with jump packs with an attached chaplain, a Sanguinary Guard squad, in which a Sanguinary Priest was attached, a couple full tactical squads in drop pods, and a Furioso Dreadnought in a drop pod. 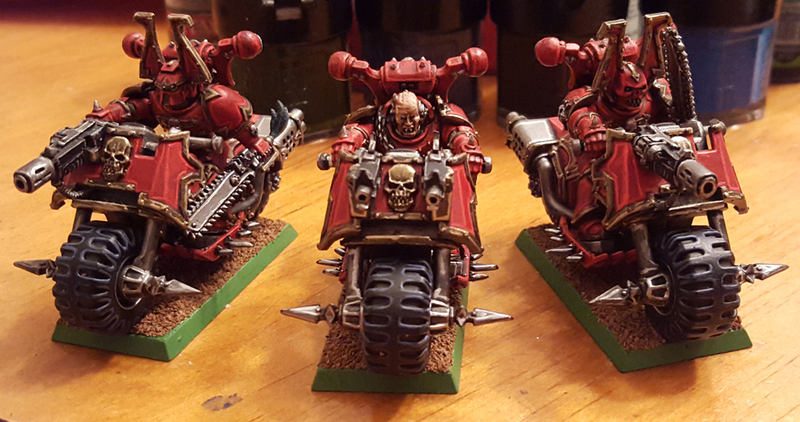 Khorne bikers are moving toward completion.